In all the talk about photographing street people, no one except Charlie D. has mentioned this yet, so perhaps it's not as well-known a trick as I thought: you take the picture first and then ask permission. If permission is granted, you take a few more (especially with digital, what can it hurt? And you might get a good one). If permission is refused, you can politely refrain...from taking any more. You still have your candid in the camera, you might say. I think this is justified because 1) it's true that you won't get the same shot after you approach someone (they can become self-conscious or just change position), 2) many people don't realize for sure if you've taken any pictures or not anyway, and 3) people mainly just like being asked. Magnum photographer Bruce Davidson, now in his 70's but still shooting projects, is rather famous for this. It's fascinating to hear him talk about some of the subjects in his photos from the 1960's through the 1980's. Just that brief contact with strangers sometimes led to life-long acquaintances. Of course he also "stole" a great many candid photos. It's impossible to do otherwise. Big (photo) game hunting on urban streets is, to a degree, much easier than 20-30 years ago. Small digital p&s cameras and disposable film cameras are as ubiquitous as Kleenex and are truly the ideal "street cameras" today. But we live in a much more litigious society. While you might catch something good what are you going to do with it? Really? Asking is good, asking afterwards necessary as you point out. I miss one hint: if the subject refuses after the fact, don't use the candid shot. It's polite. Otherwise one is just a hypocrite. ultimately none of this matters cause if you're out in the public space you run the risk of being photographed and that's that. it's the law. revisit Nussenzweig v. DiCorcia for a recent example if you wish. 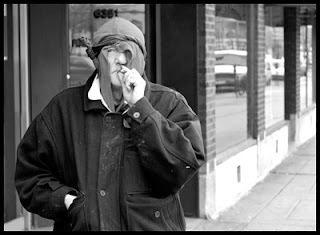 i think all this rhetoric around what is and isn't proper around street photography is such a trifling matter. what exactly is the point of trying to work up a set of etiquette rules around this anyway? as far as i'm concerned it already exists and it dictates that if you're outside you're fair game. we seem to accept the fact that we're constantly recorded by surveillance cameras but some amateur photographer is somehow a greater threat? that doesn't add up for me. this whole conversation is so played out. it's time to move on. if i want a photo of you, i'll take it. it may be impolite but it's not illegal. I disagree with "schmee". 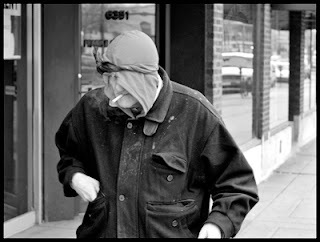 I think there are points of etiquette regarding street photography that are worth debating. And sure the topic has been going on for decades but it is beneficial nonetheless, especially for people who are just becoming interested in candid people photography and are perhaps looking for some guidelines. Having said that-I agree with Mike in that often if you ask first you miss the shot or -as has happened to me many times- are simply told to 'naff off in very certain terms. The law should not be the limiting factor on a person's behavior. I must disagree with Schmee too, simply because in the legistlative system I live in (Québec), if you sell or publish a candid photography, you are liable to litigation in the event that you have no agreement with the subject. This does not apply for newsworthy item, anything that falls under the sphere of public interest. Simple as that. If they find out, and see themselves, and they sue, you lose. As others have said, law isn't the sole determinant on one's behaviour, but dura lex sed lex. Our pictures and actual movements are captured by surveillance cameras much more than some lone photographer. Walmart I'm sure has a detailed collection of most of us. Look at what the casinos have. They can id a person and bring up more than what you would want to know about him/her within minutes of walking in their door. "in the legistlative system I live in (Québec), if you sell or publish a candid photography, you are liable to litigation in the event that you have no agreement with the subject." Same in the U.S., but it does not apply to news (editorial) photographs or art, just commercial use. And the subject can only sue for what the photographer earned from the picture. Nemo dat quod non habet. I just hope that laws are not the only constraints for whatever you do. Being a journalist and experiencing first hand the street life in Kelowna, BC here and knowing my good photographer friend who has photographed the notorious downtown east side in Vancouver, I think one has to use some caution when raising your camera and making pictures of street people who are unaware of your camera, if they see you and don't like being photographed, as some people who are on drugs can be very paranoid they may not appreciate having their picture taken and may act quite violently. In many cases they really don't have much to lose, and and would not think anything of smashing a photographer's camera gear. If one is really serious about photographing street people, invest some time, before you even taken one picture go and approach them and get to know them, if they feel comfortable with you and your camera they might let you follow them around for a while, the results will be better than any grab shot you can make walking down the street. I just returned from a trip to Oman, where I saw a group of old men playing dominoes on the street outside a mosque. One of the group got up and I asked him (in sign language) if I could take a photo of the group. He asked one of the players, who said OK. Just as I was framing the shot, another player looked up and started yelling at me "not want! not want!". I didn't press the button, but felt disappointed about it. Later I took a shot with a long lens, but it was poor,and I felt a bit bad about having taken it. What to do? Sometimes photography has to take a back seat! As a practicing street photographer I see no sense in asking people after I have taken a photo. Some spoken words on the street are no real contract for the right to publish a picture. So the only possibilty would be, to fetch out your printed Model Release. So I take my pictures, some for my blog, the rest for the archiv. A commercial use is not (perhaps in some years?) possible. I think the paradox about shooting pictures of homeless people in general is this: do you want to shoot these people as human beings or do you want to shoot misery? Because, if you talk to them you'll not get misery after they say "ok, take the picture". Nobody wants to be used as the portrait of misery. What people call "candid" here is pretty much getting them while they are displays of what we see as miserable. And that is miserable in itself. You could tell them you are trying to show others the suffering on the streets to achieve some kind of social improvement, and a very few of the homeless people you approach with such words might agree because they feel some kind of commitment to the issue, and pose as miserable, but you're almost hiring a model there. "a very few of the homeless people you approach with such words might agree because they feel some kind of commitment to the issue, and pose as miserable, but you're almost hiring a model there." No, I'm pretty sure a lot of them are genuinely miserable. I didn't explain myself corrctly, never meant that they were acting or not being really miserable, but well, let's leave it like that. I like street photography and aside from my personal work, I have done some documentary shooting which meant working in developing countries for what were- and still are- deemed to be "good causes". Even so-and I can't quite put my finger on the why of it- I still find something disagreeable about photographing people that have a grim life. Maybe it is because you get to fly home and they walk.